PHJ Tokyo staff members are happy to receive the 2017 Annual Report Newsletter of The Life Skills Development Foundation（TLSDF）on Pediatric and Family Cardiac Program (PFCP) from Ms. Ae Suthida, Program Manager. She served at PHJ-Thailand as the HOPE Partner Project Manager and Pediatric Cardiovascular Operation Support Project Manager until October 2016 and, upon termination of the PHJ Thailand projects and closure of the PHJ Thailand Office, joined TLSDF to continue the pediatric cardio program. The following is a summary of the 2017 Annual Report approved by theTLSDF Director. PFCP Project Background:Although cardiovascular healthcare in Thailand is improving, many rural regions are still struggling to access life-saving health services. This is due to many barriers including prohibitive costs, far distances to travel from rural areas to hospitals, and shortages of trained medical staff. PFCP’s aim is to help save the lives of underserved people and children with terminal heart diseases through the provision of life-saving interventions and surgeries, rural mobile cardiac screening programs, public education, and the training of nurses to provide effective and sustainable care. 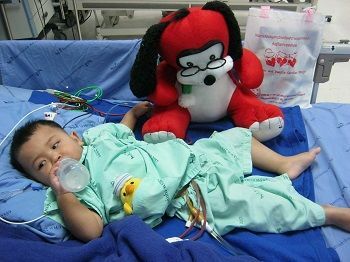 PFCP aims to help families in Northern Thailand who are underserved and are unable to cover the additional costs of their own, or their child’s heart surgeries. We work with 3 government hospitals* that are able to provide heart operations. With the support of our donors in 2017, we were able to provide 20 underserved adults as well as 8 underserved children under the age of 10 with life-saving cardiac operations. PFCP and our beneficiaries are so thankful for the support of the donors. PFCP supported a Pediatric Mobile Heart Screening in Mae Hong Son on May 27th, 2017 at Srisangwan Hospital. The province of Mae Hong Son is home to many indigenous and ethnic minority groups, and many of them live in poverty with limited access to medical care. Seventy eight (78) children ranging in age from 2 days to 15 years old, including 4 admitted patients, were screened. 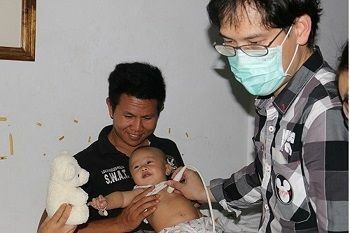 Twelve (12) patients were referred to hospitals in Chiang Mai and Lampang for further diagnosis and treatment. PFCP also held a Mobile He. art Screening on July 4th, 2017 at Chiang Kham Hospital, in Phayao province. This district is also home to many indigenous and ethnic minority groups, and has limited access to profressional and specialized health care. One hundred sixty one (161) underserved patients from all over the province were screened, and 88 were diagnosed with heart valve disease. 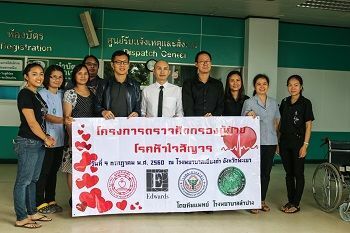 Seven (7) of thise 88 patients were referred to Lampang Hospital for heart operations. PFCP supported two (2) nurses from Nakornping Hospital to attend "The Child Cardiac Care Program" at Queen Sirikit National Institute of Child Health during June 5-9, 2017. The purpose of the training was to educate the nurses in holistic care for pediatric cardiac patients on prevention, diagnosis, treatment and rehabilitation. The nurses are very thankful for the education and have been able to pass on their training to fellow colleagues. 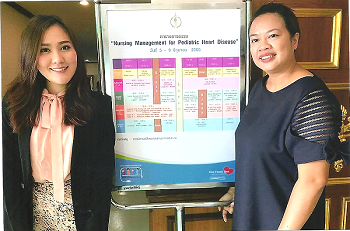 With support from our donors, PFCP helped 2 nurses from the Cardiac Unit, CMU attend the International Symposium hosted by the Heart Care Foundation in Bangkok, August 25-27, 2017. 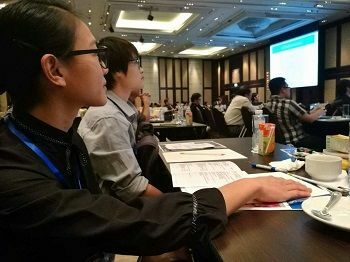 Over 30 international and Thai cardiac surgeons, cardiologists, and medical faculty were in attendance, including 4 cardiac surgeons and cardiologists we work with from CMU and Lampang Hospitals. Five main topics of valve repair, minimally invasive valve surgery, CABG, echocardiography for valve surgery, and aortic surgery were discussed. This was a fntastic learning and capacity building opportunity, and PFCP was excited to cover transportaion and lodging costs for the nurses. On September 29, 2017 in coordination with Nakornping Hospital, TLSDF participated in arranging a booth at the World Heart Day event at the Hospital. The main objective of the event was to increase knowledge and awareness for cardiovascular disease prevention among patients, families, colleagues, and volunteers. PFCP stationed a booth with games and activities regarding knowledge about heart disease, and distributed informational brochures about heart valve disease care and prevention. We are so grateful for the support of our donors for allowing this project to happen! We look forward to continuing our partnerships and to reduce the mortality and morbidity of impoverished and marginalized individuals who have or are at risk of getting critical heart diseases in Northern Thailand. 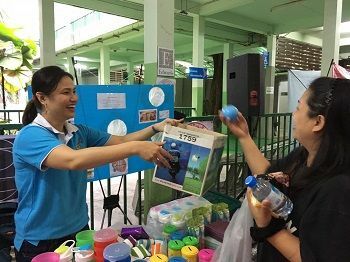 PHJ Tokyo staff members are truly happy to confirm that the PHJ project continuously implemented by TLSDF are helping underserved people in Thailand.